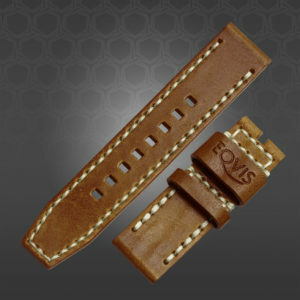 View cart “Leather Watch Strap «Cognac»” has been added to your cart. 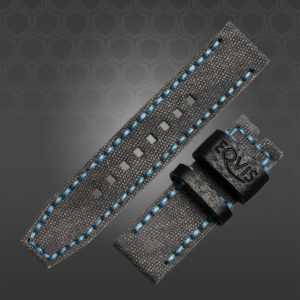 This strap measures 130 x 24 mm for the long and 80 x 24 mm for the shorter part. Each part is 4-5 mm thick at the case side and tapers down to 2-3 mm towards the other side. The lining is made from black leather. The stitching, using red thread, was executed by hand. The short buckle side comes with a fixed, 15 mm wide, black leather keeper as well as with a second, removeable, 6 mm wide keeper of the same material. 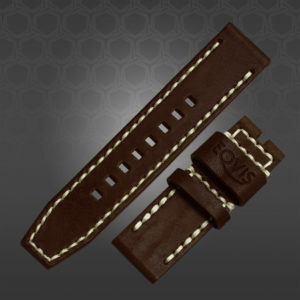 The long side has been treated to 8 rectangular holes to comfortably fit most male wrists. Please note that color and appearance of the actual product may vary slightly from the images presented here. Some materials, like titanium or bronze in particular, will develop a patina over time due to invironmental influences. This is a natural process and not subject to warranty claims. Hand-stitched watch strap made from grey canvas and leather with red stitching, 130/80 mm, 24 x 24 mm.